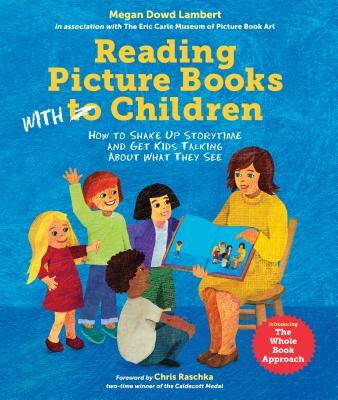 Traditional storytime often offers a passive experience for kids, but the Whole Book approach asks the youngest of readers to ponder all aspects of a picture book and to use their critical thinking skills. Using classic examples, Megan asks kids to think about why the trim size of Ludwig Bemelman's Madeline is so generous, or why the typeset in David Wiesner's Caldecott winner,The Three Pigs, appears to twist around the page, or why books like Chris Van Allsburg's The Polar Express and Eric Carle's The Very Hungry Caterpillar are printed landscape instead of portrait. The dynamic discussions that result from this shared reading style range from the profound to the hilarious and will inspire adults to make children's responses to text, art, and design an essential part of storytime. An in-depth exploration of the author's Whole Book Approach: a way to slow storytime down and consider children's responses to art, design, and other visual elements. Lambert honed her new storytime style while sharing picture books at the Eric Carle Museum of Picture Book Art. She began by using traditional methods but realized that she was representing a museum; she should focus on art and the notion of a book as an art form. Taking cues from the open-ended questions used by the Carle museum's docents, Lambert created a similar approach toward reading with children. With chapters devoted to trim size and orientation, jackets and covers, endpapers, typography, and more, there really is no better way to say it: Lambert delves into the "whole book." Librarians may quake at the thought of inviting so much discussion while reading stories to a large group, but Lambert calms fears with repeated (and adorable—such as the "heightful tower" of Madeline) examples from her many years of practice. She also shares tips and tricks to regain focus if a group goes awry. Traditionalists' concerns that the integrity of the story might be compromised by many interruptions are unfounded; Lambert rightly stresses that reading both the words and the art are equally important and provides ample evidence of children's increased engagement with the books being shared. Welcome permission to shake things up, with an important acknowledgment of the art form at the core of modern storytimes.